Scopa d'Assi - thanoscardgamess jimdo page! 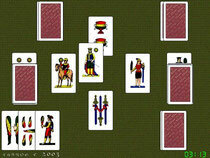 Here, you may play Scopa d'Assi (the 3-card and the 10-card variant), the standard Scopa game, and Beladonna, which is played in central Sicily. Scopa d'Assi is a version of Scopa where in addition to the normal rules of capture, playing an ace takes all the table cards. You have the option to play it using various Italian,latin-suited or french-suited, card decks. In Beladonna, there are the following points available to be won on each deal: The Cards :One point are won by whichever team has taken the majority of the cards. If they split 20-20 the points are not awarded. The Coins:One point is won by whichever team has taken more cards of the coins (diamonds) suit. The Picchiata: You score one point for Picchiata if you capture the card just played by the player to the left by playing a card of the same rank. Seven of coins(seven of diamonds):The team which takes the seven of coins scores one point. Fante of coins(Jack of diamonds):The team which takes the fante (jack) of coins scores one point. Cavallo of coins(Queen/horse of diamonds):The team which takes the cavallo of coins scores one point. Re of coins(King of diamonds):The team which takes the Re (king) of coins scores one point. Quattro sette: The team which takes the four sevens scores two points. Scopa: You score one point for emptying the table.